Install R (if you have not already done so) on your laptop or computer. Instructions for downloading R can be found in the workshop PDF (accessible above) or by visiting www.r-project.org. Once you have installed R, open the R program and type "getwd()" (without the quotes) into the R console. 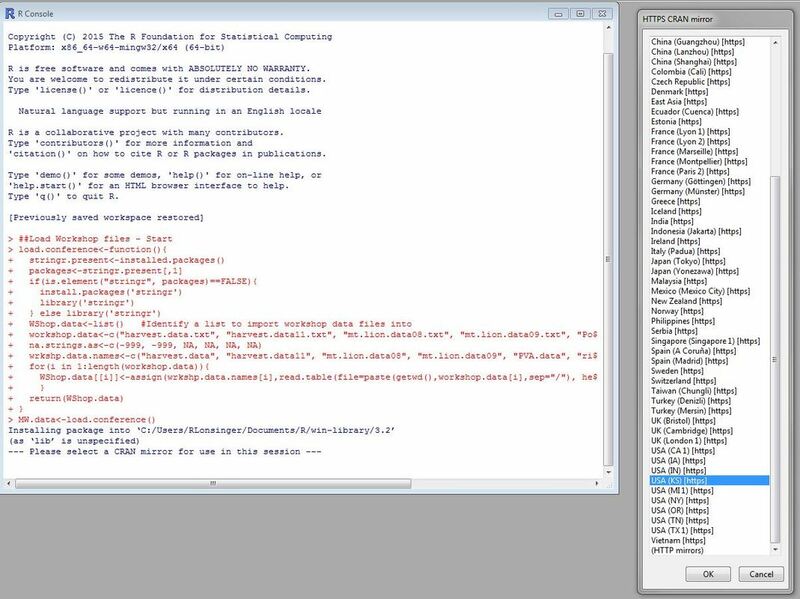 R will return the identify of your working directory (e.g., "C:/Users/RLonsinger/Documents"). From the R.Workshop > DataFiles folder that you accessed in step 1 above, select the 6 data files and copy these directly to your working directory folder. If R is not still open, open the R program. Run the code at the beginning of the R.Workshop.r file (<- this file contains R code and is provided with the course material that can be accessed above). You can open the R.Workshop.r file with any basic text editor (e.g., Notepad or Notepad++). The only code you need to run in advance of the workshop is the short section at the beginning between the "##Load Workshop files - Start" and "##Load Workshop files - End" delimiters. This code will check for necessary packages (i.e., the 'stringr' package) and install them if they are not already installed.This code will also load all of the necessary data files to R on your computer. During this process you may be prompted to select a "CRAN mirror" and should select a nearby USA mirror (see image below). After running this code, close R and be sure to save your workspace image when prompted. If you are unable to get the files loaded, do not worry, we can load them at the workshop via a flash drive. Still, be sure you install R if you hope to launch it and try some of the code during the workshop!